Arizona Considers Expanding Exemptions For School Vaccines : Shots - Health News Against the advice and pleas from doctors and medical associations, some Arizona lawmakers are pushing bills that would make it easier for parents to get exemptions for their kids from vaccinations. 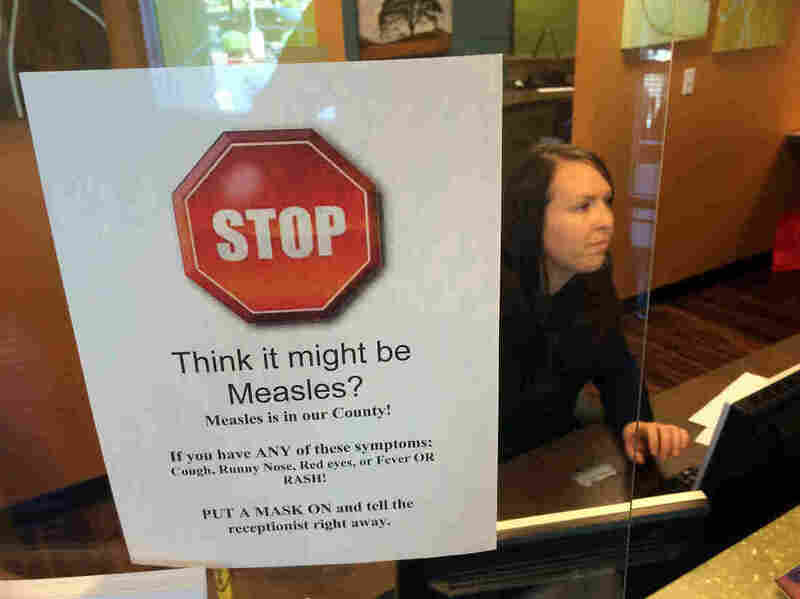 The multistate measles outbreak in 2015 led pediatricians in Scottsdale, Ariz., to warn patients they might be exposed during office visits. The state's medical associations oppose legislation that would make it easier for parents to opt out of school vaccinations for their kids. The measles outbreak in Washington state and elsewhere is prompting some states to look at tightening vaccine requirements for schoolchildren. But not in Arizona. Lawmakers there have been considering bills to make it easier for parents to get exemptions for their kids from the usual childhood vaccinations. Supporters of the controversial bills being considered in the Arizona Capitol say they are not "anti-vaccine." Irene Pi, Arizona state director of the National Vaccine Information Center, a group that lobbies against mandatory vaccinations, gave an hourlong presentation before Arizona's House health committee last month. "Let's have some sensible conversations around this and not impose a narrative on a community of people that are the injured," Pi said during her presentation. Among other things, the Arizona bills would require that before immunizing a child, doctors hand over to parents a stack of papers that include the benefits and risks of each vaccine, the vaccine manufacturer's product insert, the vaccine's summary description from the Centers for Disease Control and Prevention, and instructions on how to report a vaccine-related adverse event. Another bill in the package would make it easier for Arizona parents to opt out, adding a new type of exemption in the state — an exemption based on religious objections. The chair of the health committee, Rep. Nancy Barto, a Republican, is sponsoring the bills. "These are not, in my view, anti-vaccination bills," Barto says. Instead, she reasons, the bills are about preserving religious liberty and individual rights. But doctor after doctor at the hearing warned that the public's health was at stake. "I am disheartened and frightened that this is up for debate," Dr. Steven Brown, a family physician in Phoenix, told the lawmakers. "Voting in favor of any of these bills and encouraging more exemptions for vaccinations is dangerous for our citizens and sends the wrong message to Arizonans." Immunization rates have already been going down in Arizona, and doctors at the hearing said passage of the proposed bills would make that worse. A recent study has identified the Phoenix metro area as a national hot spot for nonmedical exemptions. Jessica Rigler, branch chief of public health preparedness at Arizona's department of health services, says more than 5,000 kindergartners in the state could fall sick with measles if there were an outbreak. "So if you've got a school where 1 in 10 children are exempt," she says, "that school is ripe for a vaccine outbreak." But that sobering scenario, and opposition from every major medical organization in Arizona, did not dissuade Republicans who control the health committee from voting the package of legislation through. Rep. Becky Nutt, a Republican representing a district in Arizona's southeastern corner, said she hears the concerns of the doctors but still thinks parents should have the right to choose on behalf of their own children. "We are in the United States of America," she says, "and we have a right to choose for our children — our religion." Democrats on the health committee called on fellow lawmakers to resist emotional appeals. "Don't confuse passion for facts," said Rep. Alma Hernandez, a Democrat from Tucson. She says Arizona needs to look at the established science when it comes to diseases that are preventable. Hernandez actually backed a bill to eliminate Arizona's vaccine exemption for personal beliefs. Though her proposal never even got a hearing, Hernandez says she's still being bombarded with hateful email from people who oppose mandatory vaccination. "I will say one thing," she says. "Comparing this situation to the Holocaust and calling me a Nazi is not going to help the cause." The bills Hernandez opposes were approved 5-4, along party lines, by Barto's committee and await a vote on the House floor. They also would have to be approved by Arizona's state Senate before going to the governor. As concerns over the proposed laws have grown in recent weeks, Arizona Gov. Doug Ducey, a Republican, has announced that he is "pro-vaccination" and "anti-measles." Ducey has promised to veto any bill that would lead to fewer kids being vaccinated.